Whether you’re hopping on a flight to visit family and friends in a neighboring state or jetting off on an adventurous vacation to a country on the other side of the world, air travel has never been easier or more accessible. With so many different airlines operating at thousands of airports all over the globe, everyone can find the right flight for them. Each airport has its own name, with many of them being named in honor of the local area or a famous person from history, but they also all have three letter airport codes in order for air workers and passengers to quickly and easily identify them. The airport code EWR is used for Newark Liberty International Airport. Where is Airport Code EWR? Airport code EWR, Newark Liberty International Airport, is located in in New Jersey, just between the cities of Newark and Elizabeth and right by the state border with New York. 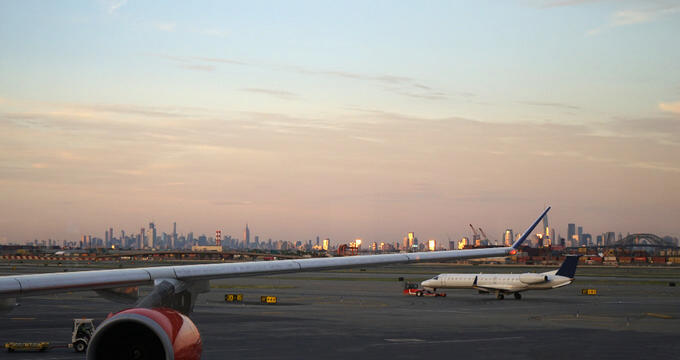 EWR is located just west of New York City, being just a relatively short distance away from downtown areas of Manhattan and the Long Island boroughs of Queens and Brooklyn. It is the primary airport for the state of New Jersey and one of the three main airports serving NYC alongside JFK and La Guardia. The address for airport code EWR (Newark Liberty International Airport) is 3 Brewster Rd, Newark, NJ 07114 and a contact phone number for general information about EWR is 973 961 6000. The staff at EWR airport are always on hand to deal with queries or questions you might have about the airport and its services. EWR, Newark Liberty International Airport, is an airport with nearly a century of history behind it. The airport first opened its doors on October 1 of 1928. At the time, it was known simply as Newark Metropolitan airport and covered around 68 acres of land along the side of the Passaic River. It was the first big airport to serve New York City. A few years later, the Newark Metropolitan Airport Administration Building was built and decorated with artwork by Arshile Gorky. This was the main terminal building for EWR until the North Terminal was constructed and opened up in 1953. The Administration Building has since been added to the National Register of Historic Places and turned into a museum. For a time, EWR was actually the busiest airport on the planet, but that all changed when La Guardia Airport opened up in 1939. As with many other airports, EWR fell under the control of the United States Military Forces during World War II. The airport was used for logsitics operations and for landing captured German planes. In 1946, commercial flights resumed at EWR. The years that followed saw expansion at Newark airport, with additional runways and buildings being constructed. It was in the 1970s that the airport earned its new name of Newark International Airport as it began operating more and more international flights to destinations around the world. There was a lot of competition between Newark and rival NYC airport JFK, with both airports vying to be the top gateway for the Big Apple. Virgin Atlantic started running direct flights between London Heathrow and Newark in an attempt to give Newark the edge, but JFK has consistently been the busier and more popular choice for passengers arriving in the big city. EWR received its current name in 2002. One of the flights involved in the tragic September 11 terrorist attacks, United Airlines Flight 93, left from Newark to San Francisco. In honor of that flight, the lives that were lost, and the spirit of the American people, the airport's name was changed from Newark International Airport to Newark Liberty International Airport. EWR is the biggest and busiest airport in the state of New Jersey and is the second major airport to serve the city of New York, just behind JFK. Statistically speaking, EWR is classed as the fifteenth busiest airport in the entire United States and is consistently in the top 50 airports in the world in terms of passenger traffic. Over 43 million passengers pass through EWR each year. 50 different airlines operate at EWR and the airport is a major hub for United Airlines and FedEx Express. The airport features three terminals and offers flights to dozens of different destinations all around the United States and other countries around the world in Asia, Europe, South America, the Caribbean, and more. The top domestic destinations to and from EWR are Orlando, FL; San Francisco, CA; Fort Lauderdale, FL; Los Angeles, CA; and Chicago, IL. The most popular international destinations are London, United Kingdom; Tel Aviv, Israel; Toronto, Canada; Cancun, Mexico; and Frankfurt, Germany. Parking at EWR is very easy and there are several different options to choose from. You can even book your parking in advance using the official Newark airport website and select your dates and times as you wish. The options for parking at EWR include short-term parking right at the terminal buildings, daily parking, and economy parking. The cheapest parking option at Newark is the economy lot which charges $18 for the first day and then $6 for every additional day. Due to EWR's proximity to New York City and the fact that many people use this airport to fly in and out of NYC, the airport is well served by many forms of public transportation. The airport has its own train station, Newark Liberty International Airport Station, which offers direct rail connections all around New Jersey and into New York City. Buses and shuttles also operate at the airport to NYC and other areas, with many taxis also running passengers to and from the airport each day. The main form of ground transportation for passengers at EWR is the AirTrain Newark. This is a 3-mile long monorail system which connects the various terminal buildings at EWR and also offers links to the airport's train station. This is a very convenient and easy way for people to get around Newark airport and the service is totally free for everyone. EWR has its own on-site hotel, the Newark Liberty International Airport Marriott. The address for this hotel is 1 Hotel Road, Newark, NJ 07114 and the contact phone number is 973 623 0006. This hotel is located right on the grounds of the airport, with free shuttles taking you directly over to the terminal buildings. The hotel features clean, comfortable rooms with nice furnishings and good quality bed linen. It also offers a laundry service, business center, gym, restaurant, cocktail bar, and cafe. Various other hotels can be found in the Newark area, here are some addresses and phone numbers for some of the best hotels around EWR.